I've set up VPN and my Unlimited Status = OK but I'm still using from my data! Do the ookyo app and VPN use a lot of battery? My Unlimited Status is 'KO'. How to fix so I get unlimited internet? Can I tether my network or use my mobile as a hotspot? The ookyo app and VPN does use battery, however, our team have done extensive tests to ensure it's optimised for nearly all common Android smartphones. We assure you that the battery usage of the app is similar to other common consumer apps. The ookyo VPN routes all of the phone's app traffic through the ookyo app to give you unlimited internet. 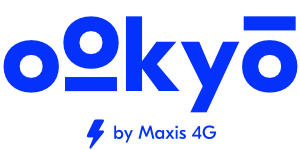 ookyo processes the data from all of the apps on your phone so that it can give you unlimited internet. However, since ookyo is processing the data from many apps, Android records the data usage as if it is coming from ookyo app itself. This makes the ookyo app's data usage look very high. The more data you use, the more battery you burn. Since the ookyo app looks like it's using a lot of data, Android therefore sees the battery usage as if it's coming from ookyo. This means that data and battery usage from Facebook, Spotify, etc. will then register as coming from the ookyo app in some phones and therefore looks much higher. What quality stream do I get with the YouTube Unlimited App (RM12 for 30 days)?